On Monday, September 24, 2018, the Blavatnik Family Foundation hosted the fifth Blavatnik National Awards Ceremony at the American Museum of Natural History in New York City. Over 200 guests attended the ceremony, including some of the country’s most prominent figures in science, business, and philanthropy. Dr. Marc Tessier-Lavigne, President of Stanford University and renowned neuroscientist, served as the Master of Ceremonies, and musicians from the Juilliard School Orchestra performed throughout the evening. 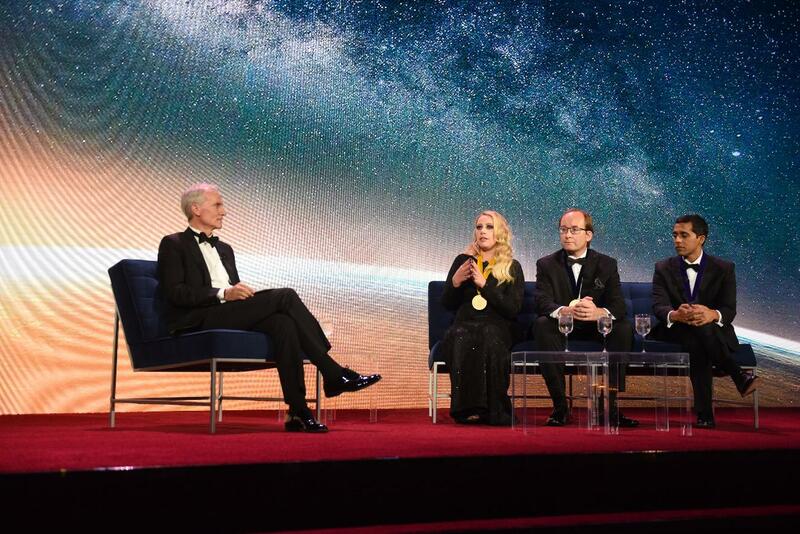 The three 2018 Blavatnik National Laureates were presented with their medals by Len Blavatnik, the Founder and Chairman of Access Industries and the Blavatnik Family Foundation, and each gave a short presentation on their research. Chemistry Laureate Neal K. Devaraj, PhD, of the University of California, San Diego, was honored for his transformative work on the synthesis of artificial cells and membranes, which has created an exciting new field of research that aims to bring greater understanding to the origins of life, a major goal in synthetic biology. “Neal is really a singularity in the world of chemical biology. It takes a lot of depth and insight into chemistry to be able to invent new chemical reactions, but at the same time he has depth as a biologist,” commented Dr. Carolyn Bertozzi, Professor of Chemistry and Professor of Chemical & Systems Biology and Radiology at Stanford University, and Neal’s mentor. A distinguished jury selected these three National Laureates from 286 nominations submitted by 146 research institutions across 42 States. Twenty-eight 2018 Blavatnik National Finalists were also honored during the evening. Dr. Tessier-Lavigne stated that 45% of this year’s honorees were immigrants hailing from nine different countries. Since the Awards inception in 2007, 249 scientists and engineers from 44 countries across six continents have been recognized by the Blavatnik Awards. As a native of Canada, he remarked, “I feel a special bond with all of them as an immigrant myself.” Dr. Tessier-Lavigne concluded the ceremony with a ‘fireside chat’ with the three Laureates, posing questions related to the future of their respective disciplines and the importance of STEM (Science, Technology, Engineering, Mathematics) education. Distinguished guests who attended the ceremony included 2001 Nobel Laureate Dr. Barry Sharpless of The Scripps Research Institute; 2006 Nobel Laureate Dr. Roger D. Kornberg of Stanford University; 2000 Nobel Laureate Dr. Eric Kandel of Columbia University; Dr. Andrew Hamilton, President of New York University; Dr. Lawrence S. Bacow, President of Harvard University; Dr. Eric Lander, Director and Founder of the Broad Institute; Dr. Bruce Stillman, President and CEO of Cold Spring Harbor Laboratory; Prof. Nili Cohen, President of the Israel Academy of Sciences and Humanities; Prof. Joseph KIafter, President of Tel Aviv University; Warner Music Group CEO, Steve Cooper; and Australian writer-director-producer Baz Luhrmann. Click here to see the Facebook Album from the 2018 Blavatnik National Awards Ceremony.